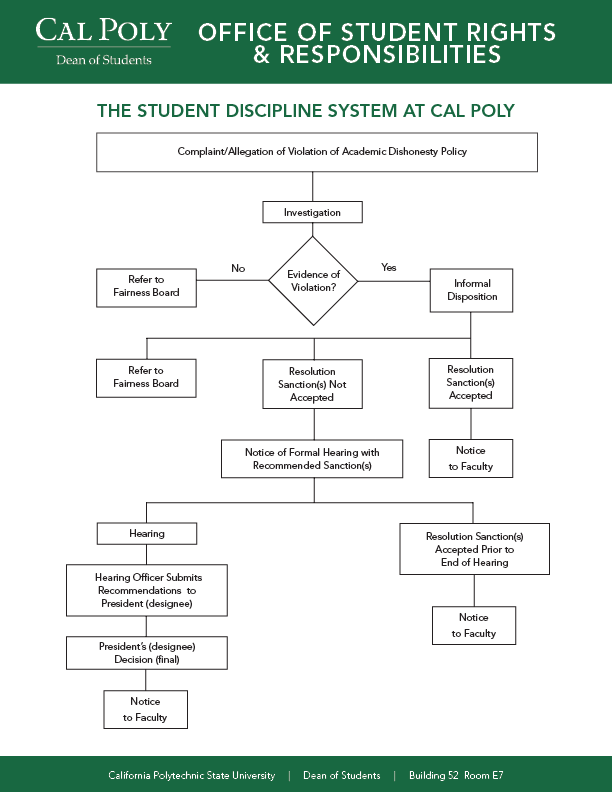 Cal Poly will not tolerate academic cheating or plagiarism in any form. Academic dishonesty is addressed both as an academic issue and as a disciplinary incident under the CSU Standards for Student Conduct. Cases of class cheating or plagiarism shall be handled by faculty members under established procedures that include written notice to the student of the incident and the consequent grade. This response is, by its nature, limited to the particular class incident. The faculty member shall then submit an online report to Student Rights & Responsibilities. This office will consider the reported incident and the academic response in the broader context of the student’s overall conduct. Cheating is considered to be unethical by the University. However, overt cheating (e.g., looking off another student’s test) is what is of consequence to the University. Plagiarism is defined as the act of using intentionally or unintentionally the ideas or work of another person or persons as if they were one’s own without giving proper credit to the source. Such an act is not plagiarism if it is ascertained that the ideas were arrived through independent reasoning or logic, or where the thought or idea is common knowledge. Acknowledgement of an original author or source must be made through appropriate references, i.e., quotation marks, footnotes, or commentary. Examples of plagiarism include, but are not limited to, the following: the submission of a work, either in part or in whole, completed by another; failure to give credit for ideas, statements, facts or conclusions which rightfully belong to another; failure to use quotation marks (or other means of setting apart, such as the use of indentation or a different font size) when quoting directly from another, whether it be a paragraph, a sentence, or even a part thereof; close and lengthy paraphrasing of another’s writing without credit or originality; and use of another’s project or computer programs or part thereof without giving credit. Submitting the same project to multiple instructors as a unique creation may also be considered plagiarism. A project produced for another class must be cited just as when citing any other source. Prior to resubmitting work from a previous course, a student must receive explicit written permission from the instructor of the current course. A project produced for another class must also be cited just as when citing any other source.